Scuba diving and snorkeling are probably the last activities anyone would ever equate with the country of Iceland. But on Day Two of our journey, that’s what we decided to do. Thingvellir National Park, located in western Iceland, is an historical and geologically fascinating area. At the heart of the park is the Lake Thingvallavatn. This lake sits in the middle of the Continental Rift, where the continents of North America and Europe come together – or rather where they are now separating at the rate of 2 cm per year. 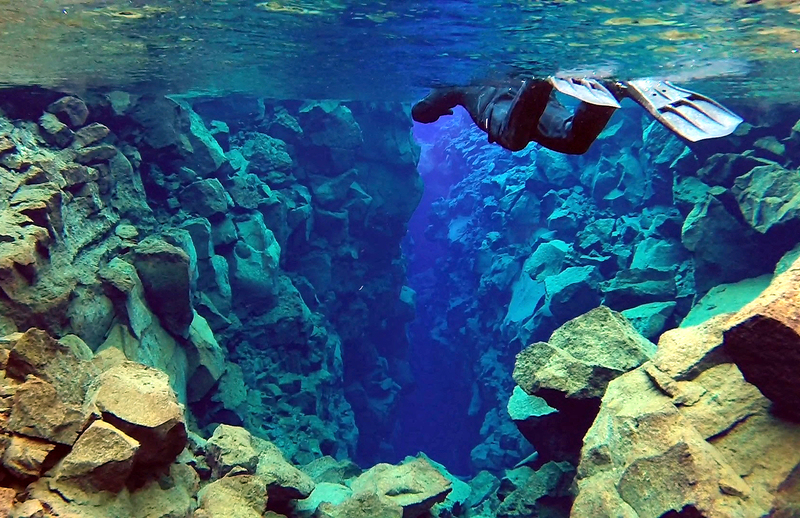 At the north end of the lake, is the Silfra Fissure, a deep narrow underwater canyon where you can scuba dive or snorkel between the two continents. 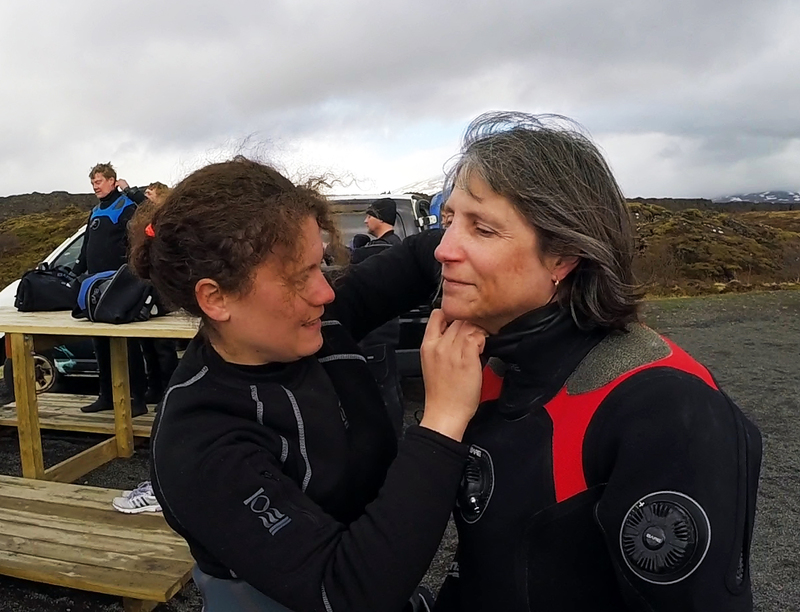 Valerie and I are both divers, but we’re not certified for diving using dry suits, which are an absolute requirement in these frigid waters (about 35°F). So, we elected to snorkel along the surface water of this amazing canyon. Getting into a dry suit is probably like getting into a space suit (and almost as complicated). First you put on a one-piece insulation layer. Then comes the rubber suit, which has very tight seals around the legs, wrists, and neck. Then comes the heavy boots, rubber gloves, and hoodie. By the time you’re all suited-up, the only thing that touches the water is parts of your face not covered by the mask. The guides were great at helping us get properly outfitted. The water temperature, which was barely above freezing, was quite shocking when my face came into contact with it. Fortunately, whatever exposed skin I had quickly numbed up and the discomfort was gone. Valerie was nervous about getting cold but said the only thing that got cold was the tip of her right index finger. The water in the canyon is amazingly clear; even the tropical waters I’ve been in were not this clear. The gentle current allowed us to float along the Silfra without too much effort. After about a half an hour of floating, we came out at the far end of the canyon. We walked back to the point where we entered the fissure, where we had a little fun jumping off the cliff into a deep hole. After having our little fun jump, we were definitely ready to get out of our dry suits and drink the hot chocolate provided by our guides. Of course, diving in the Silfra Fissure is not the only fun thing to see in Thingvellir Park. At the base of the nearby Almannagja Cliffs is the convening spot of the Icelandic Alping, one of the first democratic government bodies formed anywhere in the world. A hiking trail goes along the base to the top of the cliffs for a dramatic view of Thingvallavatn and the rift valley. Going the other direction on the trail takes you to the spectacular Oxara Falls. 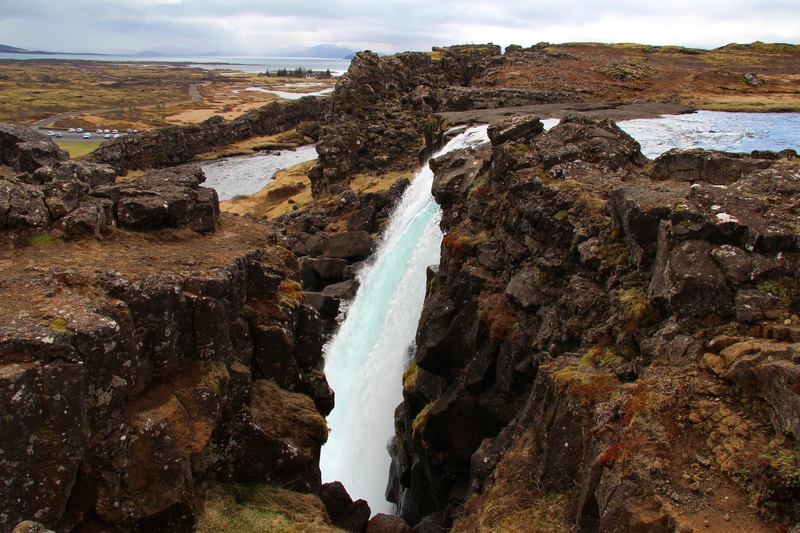 This entry was posted in International Travel and tagged Continental Rift, Dry Suit, iceland, Silfra Fissure, snorkeling, Thingvellir National Park. Bookmark the permalink.